The Chinese University of Hong Kong, commonly referred to as CUHK, is the second oldest university in Hong Kong; it is campus-based and also the only collegiate university in the territory. 1957, New Asia College, Chung Chi College, and United College established the Hong Kong Chinese Higher Education Association, same year, the colleges received government funding and academic status. 1959, New Asia College, Chung Chi College, and United College became government funded institutions of higher education. 1963, New Asia College, Chung Chi College, and United College combined to become the Chinese University of Hong Kong. 1965, School of education established. 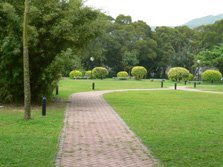 1976, the Chinese University of Hong Kong Ordinance enacted, CUHK was established as a collegiate university. 1977, School of Medicine established. 1991, School of Engineering established. 2005, program of international economy established. 2005 December, School of Law established. 2006, the establishment of two new colleges, Morningside College and S. H. Ho College, was announced. The university's founders hoped that it would become the bridge that connects China and the West, and to combine tradition with modernity. The university library system houses the Hong Kong Studies Archive, Hong Kong Literature Collection, Chinese Overseas Collection, Nobel Laureate GAO, Xingjian Collection, Nobel Laureate CY Yeung Archive, American Studies Resource Collection and Modern Chinese Drama Collection, which highlight the distinctive CUHK stock of literature in Hong Kong. In 2002, the library system held than 1.8 million items. CUHK also houses the Chinese University of Hong Kong Art Museum, which houses "a wide range of artifacts illuminating the rich arts, humanities and cultural heritage of ancient and pre-modern China. YOU BETTER THAN HONG KONG UNIVERSITY?